Munising Michigan - Lodging, Recreation, Waterfalls, and the Pictured Rocks National Lakeshore. Snowmobile Munising in the Winter, explore the waterfalls and Picture Rocks in the Summer! The Pictured Rocks National Shoreline is one of the most interesting places to view from boat or land. Munising offers year round vacation fun such as snowmobiling, charter fishing, sight seeing, hiking, boating, camping, and fun. The area boasts its many picturesque waterfalls and the Lake Superior Shoreline within the Pictured Rocks National Lakeshore. Plenty of Wonderful Lodging in Munising! Visit our Munising Hotels (Check for our many new Hotels) and Motels on the Lake and Shore! Centered in the Upper Peninsula - this location is surrounded by great activities and sights to see! Pictured Rocks National Lakeshore, Seventeen Extraordinary Area Waterfalls, Boat Tours, Air Tours, Bus Tours, Diving Tours, Camping, and More! Explore Munising Michigan and experience the most unique waterfilled journey in the Upper Peninsula. Their scenic opportunities are amazingly breathtaking. Munising Michigan and the entire Alger County area have the spectacular Pictured Rocks shoreline that rests along Lake Superior. These unique cliff edges, caves, and formations are composed mainly of limestone and sandstone. The rock formations have evolved from natural erosion, weather, water, and time. Layers of colored sediment have created the "pictured" feeling and have been sculpted by nature into interesting forms. 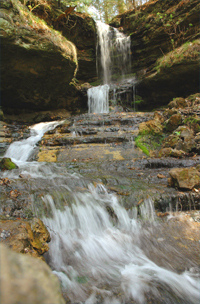 Water also caresses the landscape in the form of waterfalls. With seventeen major waterfalls, the area is a tranquil canvas of beauty. The abundance of waterfalls are a direct result of the Munising Formation (Northern Michigan Cuesta) which is comprised of the limestone/sandstone shelf that are the foundation for the Pictured Rocks National Lakeshore. Visit us soon! Click ads below to view our Munising "Superior Ad" sponsor websites.